Learned from the WHIZ reporter that one of the nation’s largest solar farms is being developed in Zanesville. This popular project, fittingly called “Turning Point,” is expected to bring up to 600 jobs through local manufacturing of the solar panels needed for the nearly 50 MW solar farm. Even more fittingly, it is being sited on a former coal mine. The project is slated to go online in 2012. Also learned I had arrived just in time for Zanesville’s 52nd annual SERTOMA Pancake Day, a fundraiser for local charities. Followed the news van there for some breakfast. What a scene. The cavernous basement was packed with people. Later learned they served 6,500 people pancakes and sausage over the course of the day. When the servers heard I had biked all the way from Colorado, Jim Drake (thanks for the contribution) stacked several extra flapjacks onto my already full plate. After devouring those, went back for seconds. Have never eaten so many pancakes in my life. Really enjoyed meeting Scott & Robin Obenour, Cindy, Chuck and Dee Dee. Before leaving, was approached by a local radio reporter who had heard I was there and wanted to set up an interview for tomorrow. Gotta love small, friendly communities like Zanesville. From New Concord, rolled down the road to Cambridge, which I easily made before dark. Beautiful day for riding. Low 50s and sunny. My buddy Paul had located a campground for me in Cambridge, right off Interstate 70, which was a real score (thanks, Paul!). 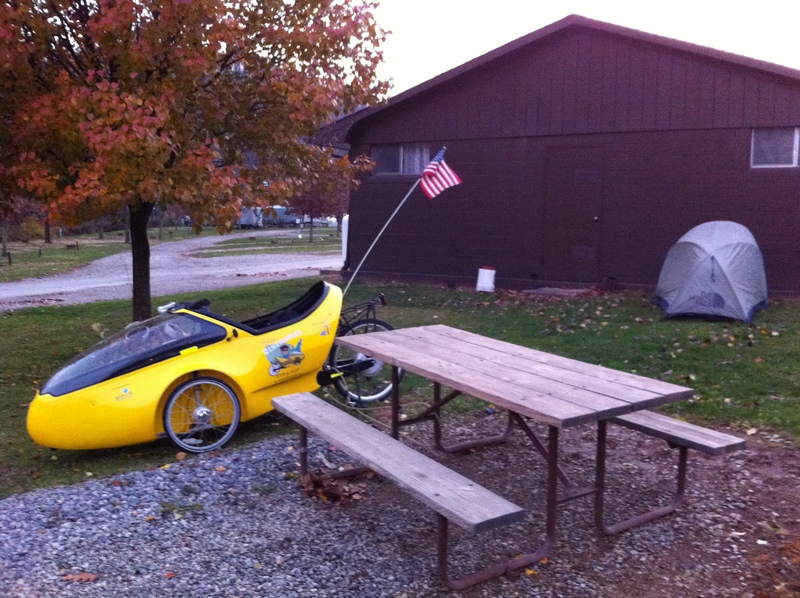 With the late start getting out of town, only logged 38 miles today, but looking forward to a good night’s sleep. If it rains tomorrow like it rained yesterday, I’ll need it. 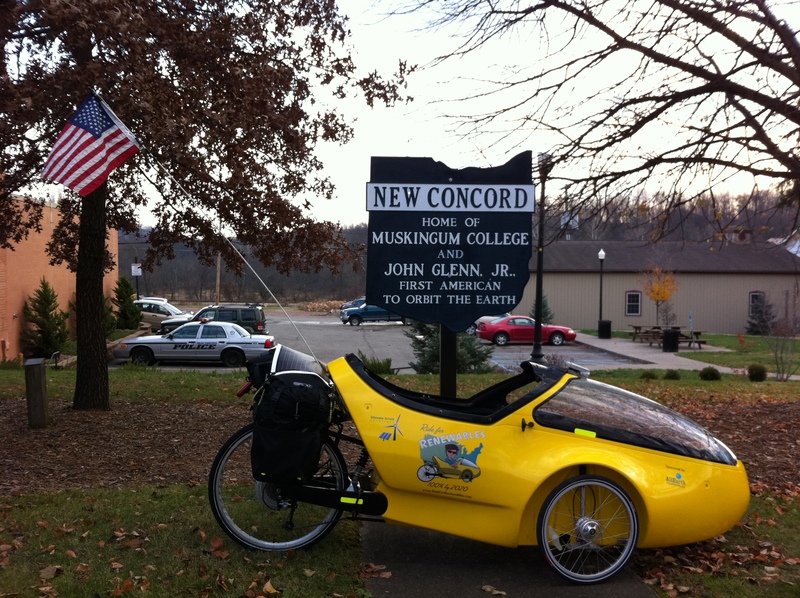 This entry was posted in 2010 Ride, Articles, Blog, Video and tagged john glenn, national highway, ohio, pancake day, ride for renewables, sertoma, solar, turning point, whiz, zanesville. Bookmark the permalink.